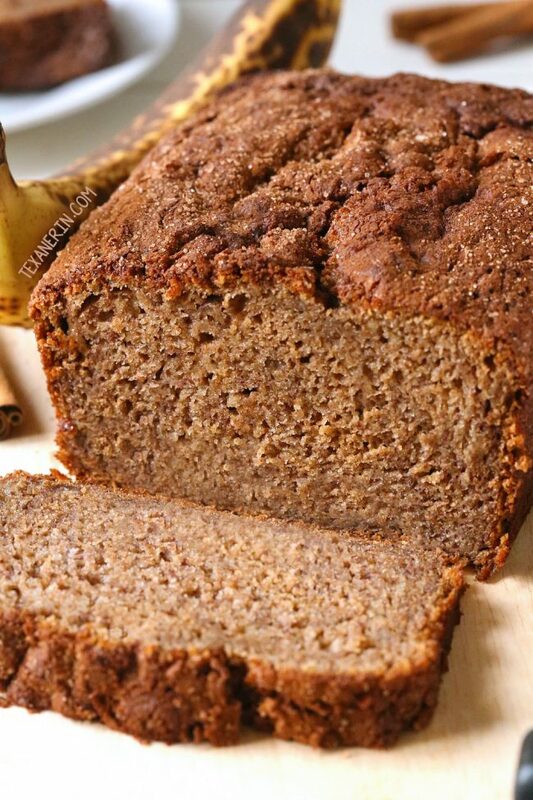 This 100% whole wheat banana bread is full of banana flavor and cinnamon and is naturally dairy-free! Can also be made with all-purpose flour. Whole wheat banana bread seems like such a boring first post, I know, but it’s one of our favorites! You really can’t tell that this banana bread is made with 100% whole wheat flour (or spelt flour!). Mr. T usually doesn’t like whole wheat treats but this is an exception. There’s so much flavor in the bananas and all the added cinnamon that all you taste is pure cinnamony banana bliss. Nobody will know this banana bread is whole wheat! One thing that’s super important is the bananas. They need to be as dark as possible. You see the banana in the background of the second picture? It’d be best if the bananas are even darker than that! If your bananas aren’t ripe enough, your bread won’t be as sweet as it should be, and since we’re reducing the sugar quite a bit, we need those bananas to be sweet. Another result is using not-ripe-enough bananas is that the bread will be less moist. More sugar = more moisture. If you find yourself with too many over ripe bananas than you need for this banana bread, you could try my peanut butter banana bars for another delicious whole grain treat! These whole grain banana pancakes would also be a delicious option! They’re made with ground up oats (oat flour) and 100% whole grain. And for a grain-free treat, try this paleo coconut flour banana bread. This banana bread recipe calls for only 3 tablespoons of oil. I used olive oil but you can’t taste it at all! I’m guessing melted coconut oil or melted butter would also work for a non-dairy-free version. The bananas and cinnamon mellow the whole grain taste that many, including myself, really dislike. You can use traditional whole wheat (which is what I use) or white whole wheat flour, which is less grain-y tasting. You can even use all-purpose flour, if you prefer. If you want to make this whole wheat banana bread it a bit more exciting, you can add walnuts or chocolate chips to the batter (like Beaming Baker did with her awesome looking Gluten Free Vegan Banana Nut Muffins!). I’m also thinking of trying a peanut butter version. What other add-ins do you add to banana bread? Hope you enjoy the bread! I’d love to hear how it goes if you try it out. If you’d rather bake it in muffin form, try these banana muffins with a Nutella swirl! 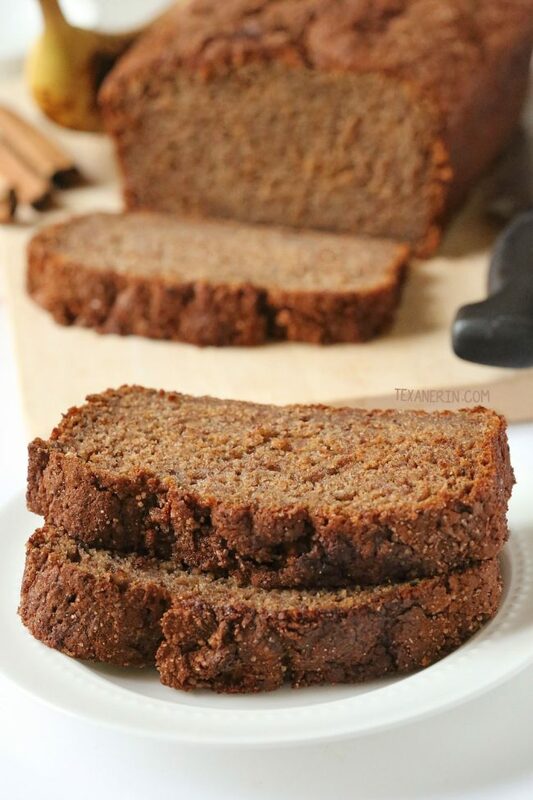 And if you’re looking for a gluten-free version, try this gluten-free banana bread from What the Fork! Preheat your oven to 350°F / 175°C. Grease a 10.5″ x 3″ (27cm x 8cm) pan and grease it well. In a medium-sized bowl, whisk together flour, baking soda, baking powder, salt, cinnamon and sugar. In another medium-sized bowl, lightly beat the eggs. Add honey, canola oil, vanilla and mashed bananas. To prevent more dish washing, I put one banana at a time in the liquid mix, and mash it with the bottom of a glass. If they’re ripe enough, really TRULY ripe enough, this will be easy. You can also puree the bananas. Add the nuts if using. Add the wet mix to the dry mix, but just until combined. Pour into the prepared pan and add cinnamon sugar, if using. Bake for 40-45 minutes. Remember to adjust the time accordingly depending on pan size. Remove to a rack to cool for 15 minutes before turning out onto the rack to cool completely. If you live in a humid environment, refrigerate this after a few days. It’s incredibly moist and humidity isn’t its friend. 22 comments on “100% Whole Wheat Banana Bread” — Add one! I unfortunately have zero experience with high altitude baking but I think this guide might be helpful! Sorry I don’t have a better answer for you. Can you substitute coconut sugar for the regular sugar/brown sugar? I haven’t tried it but I’m pretty sure it’d be fine! I made this banana bread today and it came out perfect and was very easy to make. Thanks for another delicious recipe. Hi Sravanthi! I’m so happy that you enjoyed the bread. :) Thanks for your comment! My family absolutely loves your gluten and dairy free brownie recipe! I really want to try making this recipe gluten free, but I have only just recently begun making things gluten and dairy free, so I’m just wondering if its an even swap of all purpose flour for gluten free all purpose flour, or do I need to do something different so that it still has the same consistency? I’m so happy you all like them! :) And it depends on the brand / mix you use. I use this one – 1-to-1 gluten-free baking flour – and it almost always works as a direct sub. I use 138 grams of that mix for every 1 cup of wheat flour called for. I haven’t tried it here but I think it’d work. :) I’d love to hear how it goes if you try it out! Wow! That’s a lot of yummy spices you have going on here. :) Sounds great! Thanks a bunch for letting me know how it came out! If I were to make these into muffins, would I do anything different besides bake time? how much time? I vowed to myself I would make this recipe because it was your first and I remember you writing it was one of your least popular and I felt sad thinking that your first recipe was something you were allergic to- bananas! At least I thought I read that before. Anyway, I finally made it and its delicious! I used the most disgusting black bananas and I ran out of honey so I substituted half the honey for agave. the bread was very flavorful, moist and I loved the crunchy cinnamon sugar topping. It was also a winner with my kids! Hi, I always like to try new recipes of banana bread for my boyfriend who really loves it, but this is the first time I use whole wheat flour in it! it turned out delicious! Anon – That's great to hear! I'm happy that you both enjoyed it. And chocolate chips is a nice addition! I hope your day got a little bit better after eating some banana bread. :) Thanks for the feedback! Just made this bread. I only used 3 bananas as they were kinda big and added some mini chocolate chips cause I was having a bad day. This is nothing short of awesome and it really doesn't taste like 100% whole grain. My husband loved it too! Thanks for sharing! Hi. Was wondering what i can use instead of honey?? Anon – That is indeed strange. This was my very first post and not a single comment until last night when not one but two people made it. It just made my day. Strange – I made this last night and came to leave a comment too! My husband loved this recipe so thank you! I used coconut oil instead canola oil and next time I think I will use less sugar as the bananas provided plenty of sweetness. I may also experiment and try this recipe with zucchini or pumpkin. Love your site! We are transplanted Houstonians from Canada and still trying to adjust to baking at sea level and with humidity! Made this yesterday. Yummy. First time I had ever made a whole wheat banana bread (i can't think why its taken me so long!). This recipe was completely delicious and healthy enough that I was happy for my little girls to eat – they loved this version. Only came across your site before Christmas (linked from whatcathywouldeat). Can't wait to try some more of your recipes.